While some people might consider the number “13” unlucky, experiencing any of these 13 Sonoma County wineries and their amazing wines will surely make you feel lucky. Home to 400+ wineries and 18 American Viticultural Areas (AVAs), the amazing range of microclimates distinguishes Sonoma County as one of the most diverse winegrowing regions in the world. 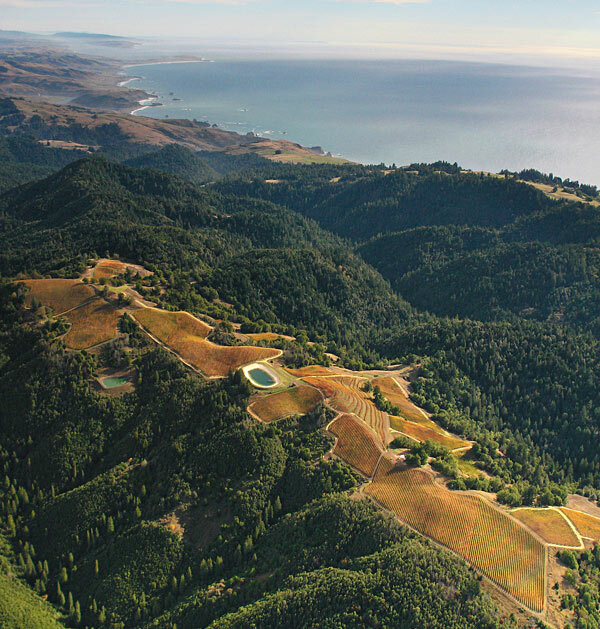 The Pacific coastline, redwood forests, fertile valleys, and mountains produce an array of exceptional wines. A quick poll netted more than 30 favorite wineries that locals love to share with out-of-town guests, which became this list of 13 Sonoma County wineries you should know. Want to do your own searching? Get the FREE Visitors Guide and Wineries Map. There are many reasons to visit this winery. Not satisfied with producing just 'good' wines, Rodney Strong created a “boutique winery within a winery” that offers premium, small-lot wines. They also host an annual Summer Concert Series taking place in the summer months, but there’s no need for a backstage pass here. There is no backstage. You’re in the middle of the action. 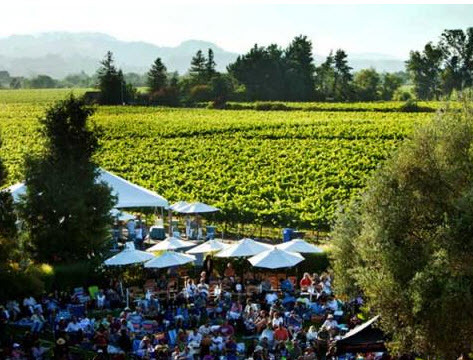 Great vineyard location, enjoying top acts, and sipping sublime wine — can a summer evening get any better? Set in the rolling hills of the Carneros region in southeastern Sonoma County, this winery was designed to evoke both the historic California missions and the heritage of the Catalonian family, owners of the Freixenet cava brand. 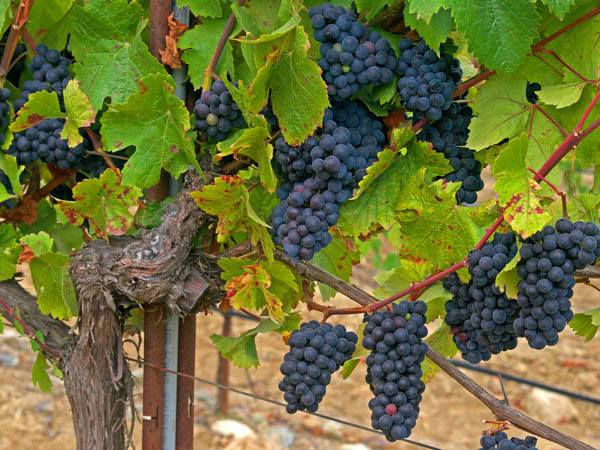 Gloria Ferrer makes some of Sonoma County’s most popular sparkling wines. After an informative tour of the caves and sparkling wine facility, savor a glass or flight of sparkling wine by the fire or on the veranda. Buena Vista is California’s oldest commercial winery and the birthplace of the state’s modern wine industry. Count Agoston Haraszthy built a stone winery on the property in 1857 and introduced cuttings from Europe’s best vineyards to California. Sign up for the "Be the Count Experience," wine blending as the Count might have done it, or taste a flight while touring the Wine Tools Museum. If you run into the Count himself, don’t be surprised; it’s all a part of the experience. Floating above the fog in the hills above the crashing waves lies the closest vineyard to the Pacific Ocean in California — Fort Ross Vineyard. It’s located in one of Sonoma County’s most unique AVAs, Fort Ross-Seaview. The new tasting room looks like one of the many historic barns that dot the landscape. Taste Pinot Noir, Chardonnay, and Pinotage, made from grapes grown exclusively on the estate. Bring a lunch, relax, and look at the spectacular views. If wine tasting evokes an image of refined elegance, this is the place to visit. Don’t let the manicured lawns and opulent chateau-style winery fool you; here, it’s all about the wines. That begins with being good stewards of the land. “We don’t just grow grapes, we grow wine.” This is evident in all of the tasting options, which include private tours, flights of a single varietal, best of the bunch, and more. Yes, there is an actual Dry Creek that runs through the same-named AVA. One of the best places to experience it is at this down-to-earth, essentially Sonoma County winery. A biodynamic vineyard, this is one place to take in fish, ducks, sheep, olives, heirloom veggies and fruits, as well as beneficial insects — all while sipping fantastic wines. 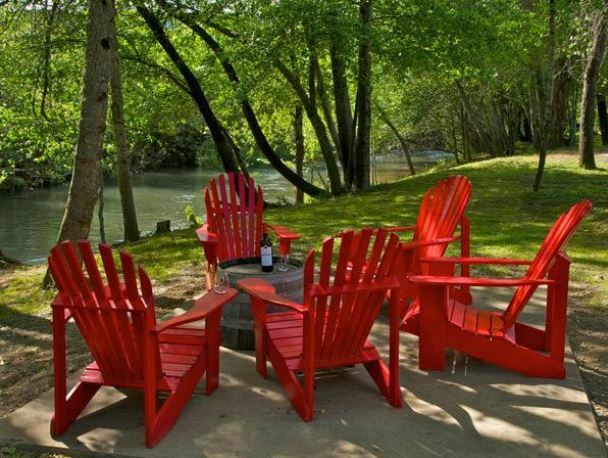 Bring a picnic, buy a bottle at the tasting room, find a spot by the creek, and enjoy. This out-of-the-way winery, tucked into the middle of Bennett Valley, boasts gorgeous grounds where lavender fields compete with vineyards for your attention. Its park-like setting makes this a great picnic location. Take in the scenery of oaks, olive trees, and native grasses while enjoying a bottle of the wonderful Merlot. The Sauvignon Blanc has quite the reputation, too. Stop by the gift shop for lavender soaps, lotions and more — made from lavender grown at the winery. When is the top restaurant in America not a restaurant? When it’s St. Francis’ food and wine pairing. OpenTable.com users named the winery the top restaurant in the U.S. And they aren’t wrong. The pairing features a five-course tasting menu prepared by the winery’s own executive chef, who uses produce and herbs grown on the estate, paired with wines from St. Francis’ artisan collection. The stunning Sonoma Valley view just adds to the experience. The wines and the architecture here offer visitors a strong sense of place. The winery, opened in 2011, resembles the weathered farmsteads that dotted the landscape 100 years ago. Wines are crafted from grapes locally sourced, imbuing each sip with the taste of place. Food and wine pairing options are available, from a simple chef-packed picnic to pair perfectly with the wine choice, to the “Behind the Gate” experience that’s part tasting, part cooking class/demo. By appointment only - call to book. Founded by Bohemia-born brothers Francis, Joseph, and Anton Korbel in 1882, Korbel is the oldest continually operating champagne house in North America. Nestled in California's Russian River Valley, Korbel has always followed the time-honored methode champenoise tradition. Enjoy a history tour, wine tasting, or grab lunch at the deli. 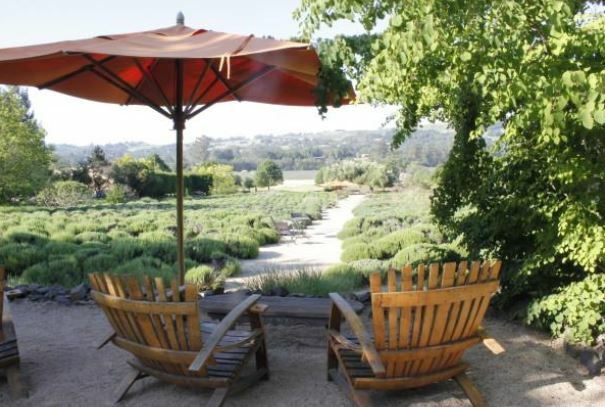 Then sit on the deck shaded by towering redwoods and overlooking the vineyards. In the spring, visit for the garden tour. At Lynmar, terroir, that special “taste of place,” is found in the estate-produced wines and the onsite kitchen gardens that make the culinary program so spectacular. Pairings range from a reserved, in-depth seated lunch, to a picnic, to a bar menu that includes cheese plates, nuts, and olives, and even gourmet popcorn. Make it a complete Wine Country experience by booking an overnight stay at the winery’s cottage, Bliss House. Not content with just producing enjoyable wine, Francis Ford Coppola showcases it, complete with Hollywood magic, in Alexander Valley. Film memorabilia — including the Godfather’s desk, a Tucker car, scripts, and Oscars — enchant visitors. The estate is not just a winery, it’s a resort that includes a full-service restaurant, snack bar, full bar, and pool. Yes, pool; complete with cabines to rent for the day — be sure to reserve your spot early; it fills up fast. 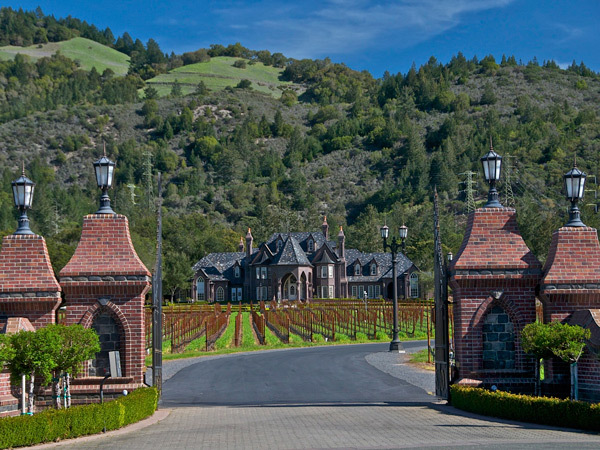 Ledson is one of Sonoma County’s wine castles because of its perfect pairing of gothic spires and archways with the rugged, mountainous backdrop of this particularly scenic stretch of the Sonoma Valley. The style is French Normandy, not Valhalla, and it was originally built as a family residence. Inside, it’s handsomely furnished, has private rooms and a second-floor seating area, and a full deli. Picnic grounds under the oaks. 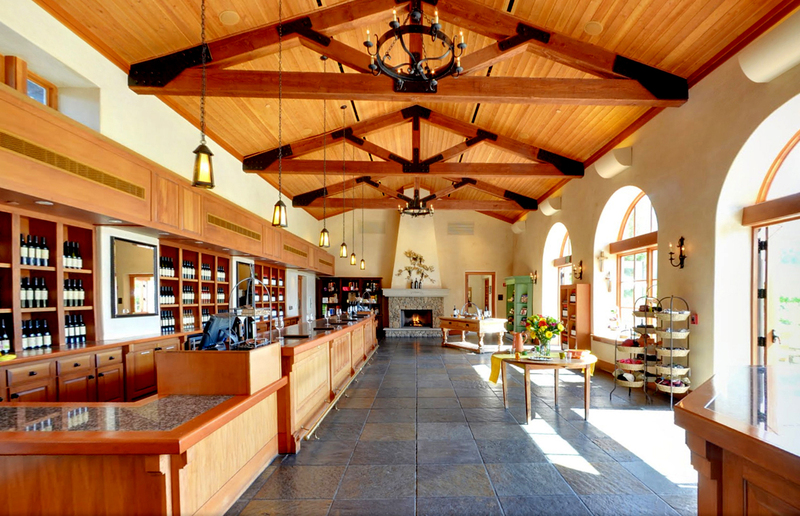 Details: 7335 Highway 12, Kenwood, 707-537-3810; open daily 10 a.m.–5 p.m.
Want to explore all of the wineries in Sonoma County? Get the FREE Wineries Map. You can recommend checking out our 7 tips for Sonoma wine tasting, so that you'll be a pro when your time comes to visit them. Want to fly directly into Sonoma Wine Country? The STS - Sonoma County Airport in Santa Rosa offers non-stop flights from Los Angeles, Orange County, Portland, Seattle, San Diego, San Francisco and more. Be sure to follow us on Facebook and Instagram for more ideas when planning your trip to Sonoma County.